Gently used full sized Net with all associated accessories available for the bargain basement of $250 in East Orlando. Interested? Leave a message for Tony "Top Cat" Caruso at 407-832-4760. Cubs Win 9-2 over the Blazers MikeSkyles pitched 8 giving up 1 run, striking out 5. Randy Davis closed the door in the 9th. Cubs bats were hot to start off the season. Big hitters of the day, Skyles 4-4 with two doubles, Davis and Jeremy Louderback 3-4. Cerna, Muniz and Page all went 2-4. Joe Hamilla and the A`s cruised to victory over the Reds in their opener by a score so lopsided, prudence and propriety prevent me from posting it here. January 13, 2019 - Spring season 2019!!! We`re going to get going early this year, try and stay out of the summer heat a bit ...So new players, free agents and returning players, we`re going to have a signup and short workout next Sunday the 20th, and you should be on a team and playing ball that day! If we can get a few things together, we will be playing games the following Sunday the 27th! Next Sunday, the 20th of January, we`ll throw it around a bit, take a few cuts and a short IF/OF. Not a tryout, just a workout, the main thing is to make sure we help teams replace and replenish players who have moved out of the area or hung it up. We`ll have it at Edgewater High School in College Park. If you Google Map it, come in through the back entrance, which is found by turning on Westmoreland from Maury. Come up a couple blocks, and you`ll see the field on your left. Pull in there and you can park next to the field. You might want to move a ways from the door, to avoid foul balls. It`s a nice field, the coach is working hard on it, so we want to warm up and throw in the OF. No big worries, just a light workout, we have a spot for everyone..10:30 Am for registration, 11 for the workout, we should have you out of there 12:30ish, if you`re a football fan. $150 dues for the spring, which gets you membership,fields, umps, balls, awards, website, liability insurance (not medical! ), playoffs, eligibility for tournaments and some great camaraderie with some like-minded folks in Orlando`s longest continuously operating men`s baseball league. Uniforms and hats and equipment may not be supplied by the teams, though some have team helmets, gear and a few have team uniforms. You can use a credit card on the PayPal button on the left of this note, or you can mail a check to CFL MSBL, PO Box 4025, Apopka, FL 32704. If you can`t pay that day, then just as soon as you can, we have a pretty simple rule, No Pay, No Play. Merry Christmas and happy holidays to all of the players and their friends and families. All the best for the New Year to all!! December 16, 2018 - Phillies and Rock On are Fall Champs! Scott Budds outdueled Rick Sanders as the Phillies continued their historic run of championships, upsetting the previously undefeated Blazers on Sunday morning in the conclusion of a suspended game. The Rock On prevailed with Mike Arsenault and a parade of good pitching holding down the powerful Brunch hitters Sunday afternoon. Details and team pictures to follow. Congratulations to all our teams, playoff and otherwise for another great season. Stay tuned for spring 2019 season details, we`re going to try and start earlier and end earlier and stay out of the June heat. More soon! Good luck to all teams after another great season! Matt Alacci returned to the mound on Sunday and sparkled as the Pirates downed Rock On, 15-7. Alacci threw a complete game, allowing three earned runs while striking out eight and walking one. He also did some heavy lifting at the plate, going 2-4 with a home run and 4 RBI. Patrick Cahill led the way with a 3-4 day at the plate, including 3 RBI and 3 runs. Nine of the Pirates` 11 batters had hits, and the top four batters combined for 12 RBI and nine runs. It was a team effort, as the bottom two batters contributed five runs with two walks and two stolen bases. Orlando Brunch ran off with the lead late in the game in a 4-3 victory over Expos on Sunday. The game was tied at three with Orlando Brunch batting in the top of the eighth when Brady LaBarge singled on a 1- 0 count, scoring one run. Orlando Brunch fired up the offense in the second inning. Jason Hellreigel`s sac fly scored one run for Orlando Brunch. In the bottom of the seventh inning, Expos tied things up at three when Shaun Delozier threw a wild pitch allowing one run across the plate for Expos. Delozier was credited with the victory for Orlando Brunch. He surrendered three runs on nine hits over eight innings, striking out 15. Orlando Brunch collected eight hits on the day. Jonathan Marrero and LaBarge each had multiple hits for Orlando Brunch. Marrero led Orlando Brunch with three hits in four at bats. Expos tallied nine hits on the day. Lewis and Alba all managed multiple hits for Expos. Lewis went 3-for-4 at the plate to lead Expos in hits. Early Lead for Orlando Brunch Sets Stage for Victory Over Expos An early lead helped Orlando Brunch defeat Expos 11-4 on Sunday. Orlando Brunch scored on a single by Brady LaBarge, a single by Jonathan Marrero, a single by Austin Sanders, and a single by Joe Hellriegel in the second inning. Orlando Brunch secured the victory thanks to six runs in the eighth inning. Orlando Brunch batters contributing to the big inning included Dave St. John, LaBarge, and Dylan Kipp, all sending runners across the plate with RBIs in the inning. Orlando Brunch put up six runs in the eighth inning. Orlando Brunch`s big bats in the inning were led by singles by St. John and LaBarge and a home run by Kipp. Shaun Delozier earned the win for Orlando Brunch. He allowed four hits and four runs over nine innings, striking out 11. Orlando Brunch socked one home run on the day. Kipp had a long ball in the eighth inning. Orlando Brunch had 16 hits in the game. LaBarge, Hellriegel, Kipp, Delozier, Sanders, Mike Price, and Marrero each collected multiple hits for Orlando Brunch. LaBarge went 3-for-5 at the plate to lead Orlando Brunch in hits. Pirates came out with the early scoring on a few miscues by the Cubs. Cubs got things back under control Scoring 2 in the 2nd, 2 in the 3rd, 6 in the 5th. Zax Little made his fall pitching debut going 8 innings striking out 9 for the W and holding the Pirates to only 3 unearned runs. Notable hitters for the Cubs. Burgess 3-4, Vasquez 2-4 w Double and 4 RBI, Muniz 2-4, Garcia 2-3 w 2 RBI, Santiago 2-4. 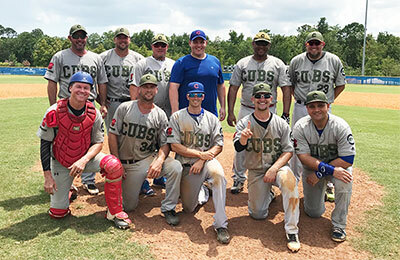 The Orlando Expos continued their winning streak, beating the Cubs 9-2 Sunday at Clermont Bishop Field. The Expos had production from the entire lineup with all players reaching base and all but one had a hit. Offensive leaders were Cameron Reisen (3-4, 2R, 2RBI), Kevin Salcedo (2-4, 2 RBI) with a key double to center and Chris Stahl (1-4, R, 2BI) who laced a triple over the center fielder to seal the game. The Expos had strong pitching performances from winning pitcher Drew Mikler (5IP, 1R, 0ER, 2K) and the closer, Cameron Alba (3IP, 1R, 4K, Save). The Blazers started off quick and kept the pressure on the Mets in route to a 24-7 win. Everybody chipped in offensively Sunday at South Orange. Doug Davis hit a 3 run homer (third this season) and was a triple short of the cycle. Lilio Alvarez racked up 4 hits and 4 RBIs. Dennis Smith and Carlos Ruperto each had 3 hits. Rick Sanders had 2 doubles and 3 RBIs. Tony Caruso knocked in 4 runs, Bill Musacchio slammed a double to deep right center, and Orlando "Thunder" Boyer had 2 hits and a stolen base. Matty Conrad had 2 hits and scored 4 runs and then swooped in and Vultured the win in relief. 10/14 v. Rangers The Orlando Expos won a thrilling 8-7 victory on Sunday at Edgewater High. The final out was a hit to right field thrown out at first base by Chris Stahl and with a great pick by Drew Mikler. The Expos offense got off to a slow start, but scored 8 runs over the final 4 innings. The relief pitcher, Peter Amico, was handed a 6-5 lead and promptly gave up two runs while hitting two batters. However, after his offense gave him two more runs in the top of the 7th, he pitched a 1-2-3 7th (including the final play scored 9-3). Offensively, it was a full team effort, with 7 different players scoring runs (Mikler scored twice) and lots of clutch hitting. Blazers beat Reds to Stay UndefeatedTony Caruso pitched 6 strong innings giving up 3 runs and Lilio Alvarez came in to close things out as the Blazers won 7-5 against the scrappy Reds and extend their record to 6-0. Lilio also had a big game at the plate with a key opposite field double that drove in 2 and finished with 3 RBIs on the day. Orlando Brunch defeated Rangers 13-2 thanks to a strong start. Orlando Brunch scored on a groundout by Jason Hellreigel, a single by Matt Sleik, a single by Mike Price, a single by Joe Hellriegel, and an error in the second inning. Orlando Brunch secured the victory thanks to eight runs in the seventh inning. Kevin Boyce, Price, Hellriegel, Cory Veres, Shaun Delozier, and Sleik each had RBIs in the big inning. Orlando Brunch pulled away for good with five runs in the second inning. In the second Hellreigel grounded out, scoring one run, Sleik singled on the first pitch of the at bat, scoring one run, Price singled on a 2-0 count, scoring one run, Hellriegel singled on a 0-1 count, scoring one run, and an error scored one run for Orlando Brunch. The offensive firepower by Orlando Brunch was led by Boyce, Price, Hellriegel, Veres, Delozier, and Sleik, all sending runners across the plate with RBIs in the inning. Delozier was the winning pitcher for Orlando Brunch. He surrendered two runs on three hits over seven innings, striking out seven and walking zero. Sr toed the rubber for Rangers. He surrendered five runs on ten hits over four innings, striking out one and walking zero. Mike and Jack entered the game from the bullpen, throwing two innings and one inning respectively. Orlando Brunch racked up 14 hits on the day. Delozier, Veres, Price, Hellriegel, and Tony Addeo all collected multiple hits for Orlando Brunch. Delozier led Orlando Brunch with three hits in four at bats. Manny is Back!! Manny Ortiz came off the DL and went 3-4 as the Blazers topped the A`s 10-0 to go to 5-0 on the season. Rick Sanders was in the zone and limited the A`s to 4 hits over 7 innings earning a complete game shutout win. The defense was tight behind Rick. Doug Davis went deep for the 2nd time this season and knocked in 3 runs. Tony Caruso had 2 doubles and 2 RBI`s and Bill Musacchio drilled a deep double to right and knocked in 2. Dennis Smith and Ricky also chipped in a couple of hits. Orlando Brunch fell behind early and couldn`t come back in a 12-0 loss to RockOn on Sunday. RockOn scored on an error, a passed ball during Johnston`s at bat, a single by Jonathan Perry, and a walk by Olinn in the first inning. The Orlando Brunch struggled to contain the high-powered offense of RockOn, giving up 12 runs. In the first inning, RockOn got their offense started. An error scored one run for RockOn. A single by Tony Addeo in the third inning was a positive for Orlando Brunch. Mike Arsenault earned the win for RockOn. He went six innings, allowing zero runs on one hit and striking out eight. Cory Veres took the loss for Orlando Brunch. He surrendered five runs on four hits over one inning. Addeo went 1-for-1 at the plate to lead Orlando Brunch in hits. Paul Belknap led RockOn with two hits in three at bats. RockOn didn`t commit a single error in the field. Belknap had the most chances in the field with eight. Cubs 9 - Pirates 4 It was a close battle for the first 6 innings with the Pirates up 2-1 and then Cubs bats finally woke up in the 7th scoring 3 then another 3 runs in the 8th and 2 insurance runs in the 9th. Pirates scored 2 in the bottom of the 9th but the damage was too deep for a Pirates come back. Felix Reyes got the W pitching 7 innings, 10K`s, 1 BB, 4 hits. Jeramy Louderback got the hold. Notable hitters. Chris Stone, 2-4, Javi Santiago 2-4, Zak Little 3-4, Mike Skyles 3-3 and Guillermo Garcia 2-4, Tristan Page 2-5. The game was tied at five with Orlando Brunch batting in the bottom of the seventh when Jason Hellreigel singled on the first pitch of the at bat, scoring one run. The base paths were crowded in this high-scoring game. Orlando Brunch collected 12 hits and Cubs had 13. Orlando Brunch opened up an early lead in the second inning when Austin Sanders`s sac fly scored one run for Orlando Brunch. Orlando Brunch evened things up at five in the bottom of the fifth inning. Jonathan Marrero singled on a 2-1 count, scoring one run. After Cubs scored one run in the top of the fourth, Orlando Brunch answered with one of their own. Cubs scored when Vasquez hit a solo homer. Cubs scored three runs in the fifth inning. The big inning for Cubs came thanks to a groundout by Stone and a double by Page T. Shaun Delozier was the winning pitcher for Orlando Brunch. He went seven innings, allowing six runs on ten hits, striking out nine and walking zero. Cory Veres and Mike Price entered the game out of the bullpen and helped to close out the game in relief. Price recorded the last three outs to earn the save for Orlando Brunch. Orlando Brunch saw the ball well today, racking up 12 hits in the game. Dave St. John, Sanders, and Marrero all managed multiple hits for Orlando Brunch. Marrero, Sanders, and St. John each managed two hits to lead Orlando Brunch. Cubs racked up 13 hits on the day. Louderback, Stone, and Santiago each collected multiple hits for Cubs. The Blazers topped the Sox 11-1 at Clermont Bishop behind 8 innings of strong pitching by Tony Caruso. Everybody chipped in at the plate led by 2 hits by Dave Gushleff, Dennis Smith, and Matt Conrad. Pirates 9, Expos 6 The Pirates outscored the Expos 9-2 over the final 4 innings to claim a 9-6 victory on Sunday. The third inning saw the Pirates score 5 runs, with Jae Ortiz, Matt Alacci, and Kilgas all tallying RBIs in the inning. The game was tied at 6 in the bottom of the fifth when Paul Kilgas singled in the go-ahead run on a 1-2 count, and the Pirates added two more runs with two outs to claim the victory. Alacci allowed six hits and five runs over 5.1 innings, with Stephen Bordenkircher getting the final two outs to earn the save. Kilgas was 2-2 with 2 RBI, 2 runs, and 3 stolen bases, while Ortiz was 1-2 with a run and RBI. RockOn Win 7-3Mike (Water Boy) Aresenault pitched the whole 9 innings with 13 K`s. David (Micro) Johnston went 3 for 4, and Joey (DadBod) Burkhalter continued to be a wall at shortstop with 4 stops. Blazers Win to Move to 3-0.Rick Sanders out dueled Warren Hanson in a 5-4 Blazer win over the Phillies. Doug Davis hit a long homer and was 3-4 on the day. Rick helped himself with 2 hits and a RBI while Tony Caruso and Dennis Smith chipped in with 2 hits each. The Polk County Sox survived double header day with a win and a tie. In the first game of the day the Sox beat the Mets 16 to 2. Bobby Ruis started, going 4 and a third innings only giving up one earned run, Ric Moots came in and threw the last 2.2 picking up a pair of K`s. At the plate for the Sox, Sean Williams, Jason Diaz, Moots, Randy Phillips,Daryl Fenley and Paul O Segarra all had two hits, and Segarra drove in 3. In game two the Sox fell behind early and fought their way back with two runs in the bottom of the eighth to tie the Yankees 6 to 6 as time expired and weather was approaching. Eric Haynes went 7 innings on the mound striking out 5 and allowing 3 earned runs. Haynes also scored 3 runs on a hit, 2 walks and a HBP at the plate. DJ Rogers scored 3 runs as well picking up a hit and two walks while stealing 6 bases along the way. Jason Diaz had two hits and two RBIs. Pirates 8, Rangers 8 The Pirates were unable to hold an 8-3 lead in the last inning on Sunday, as poor relief pitching undid a gutsy 5-inning effort from Alex Reszitnyk. Matt Alacci, Matt Johnson, and Reszitnyk each collected two hits. The Pirates also stole nine bases but left 10 runners stranded. Cubs - 5 Rock On 2 Felix Reyes throws another gem. Striking out 8 and only giving up 1 earned run in 8 innings. Cubs Scored in the 1st but the Rock answered right back in the 2nd. Rock On scored another in the 5th to break the tie. It remained 2-1 until the 7th. The 7th started off with an error and the Cubs took advantage putting up 4 runs in the inning. That`s all it took to secure the W. Jeramy Louderback came in for the 9th to shut the door and get the save. Notable hitters Leo Vasquez 1-2 with a Double, Chris Stone 2-3. Cubs Win!Another strong outing for Felix Reyes as he throws 7 innings giving up only 2 hits and 2 runs. Tristan Page gets the 2 inning save in the 4-2 victory. Notable hitters. Tristan Page 3-4, Leo Vasquez 2-4, Jeramy Louderback 2-3, Bo Burgess 2-3. Felix Reyes made his Cubs debut shutting down the Expos striking out 11 and only giving up 3 hits. Tristan Page was 2-2 with 2 Doubles, Chris Stone 2-4 with 4 RBI,Todd Little 1-4 with 4 RBI. Jason Page 2-3. August 22, 2018 - Opening Day! This Sunday, the 19th of August, at 10 AM at Edgewater High School is the date and time for the fall draft. All teams are looking for new players! Everybody is welcome, new players to the league and those returning but looking for a new start. The best way to reach the field is to turn on N. Westmoreland off Maury, come down a couple of blocks, and turn left behind the field. We`ll have a light workout, get you picked out and on a team, and on your way by noon, if all goes well. Remember, it`s a light workout, not a tryout, so the main thing is to get stretched out properly and refrain from straining anything. It`s not a skills assessment, it`s just so we can match guys to teams that need what they play. The league costs $140 this fall, for 12 games plus playoffs, if eligible. We start the 26th of August and hope to wrap up the regular season before Thanksgiving. Balls, fields, umps, liability insurance, (not medical) are included, among other things. There may be a slight additional charge for uniform tops and/or hats. You can bring a check, cash or Money Order, you can pay with a credit card on the league website using the PayPal Service, (button on the left), you can mail it to CFL MSBL, PO Box 4025, Apopka, FL 32704, but without paying, there is no playing, unfortunately. Let me know if we can expect to see you out there, send a note to blevinsknows@hotmail.com or just come on out. We look forward to having you in the league! July 31, 2018 - All Star Game and Home Run Derby! Should be a fun event for all, whether participating or not. Always good to see and play against old friends and hopefully make new ones! There will be refreshments available, bring the family! Fall baseball is practically here! June 24, 2018 - Phillies Repeat, Cubs and Nationals New Championship! The Phillies repeated (and repeated, and repeated, and....) The Cubs won their first championship, and the Nationals won their first. Game details to follow! For the Cubs, Randy Davis goes the distance, striking out 6 in the 10-3 Victory. The Brunch bats were held to only 4 hits, Cubs Hitters included Redlin 3-3 with 3 singles, Vasquez 2-3, 2 singles and 2 RBI. Stone was 2-4 with 2 singles, Page, J 2-4 with 2 singles and 2 RBI. Mike Skyles and Jeremy Louderback saw their efforts in building a championship caliber team pay off, with their first crown. Heavy favorites RockOn were knocked out in the morning game by the upstart Brunch in a 3-2 classic. That left a tall order for the Brunch in the June heat, to have to win 2 games on the same day. They hung in for 5 innings, but wore down eventually, and the Cubs took advantage. For the Nationals, Kutler Lane pitched a complete game gem, giving up no earned runs, and managers Patrick Smith and Bradlee Cox had their first crown in only their second season. The Mets gave them a game, but came up short of being the Cinderella at this year`s ball. For the 38+ Phillies, a 6th championship in the last seven seasons seems like routine, but that accomplishment is anything but. Scott Budds went the distance for the Phils, holding the hard-hitting A`s off the score board until the last frame. Manager Dan Jarvis and the Phillies kept up the offensive pressure on every pitcher A`s manager Adam Bransfield threw out there, and the Fightin`s were able to coast to victory. Congratulations to all of our champions, to all of our playoff contestants, and a hearty thank you to all players, our umpires, and especially our friends and families who allow us the time to be able to come out and play this wonderful, confounding children`s game. Have a great summer, details on the fall season will be released before you know it! The Mets had a combined pitching effort by Paul Messina, Matt Soletti, and Kai Maynor, holding the tough- hitting Bears to only 3 runs. They had timely hitting by Stephen Pokol, hitting a double and driving in two runs, late in the game, to tie the game at 3. In the top of the seventh inning, Matt Soletti hit a double, driving in Kevin Green for the go-ahead run. For good measure, Thomas Doty drove in the fifth and final run of the game for the Mets, making the final score 5-3 in favor of the Mets and allowing the Mets to move on to the championship game against the Nationals next Sunday. Orlando Brunch was victorious over Rangers, 5-2 In the first inning, Orlando Brunch got their offense started when Shaun Delozier doubled on a 1-0 count, scoring one run. Delozier earned the victory on the hill for Orlando Brunch. He allowed 11 hits and two runs over nine innings, striking out ten. Rikki Kline took the loss for Rangers. He surrendered five runs on 13 hits over nine innings, striking out nine. Orlando Brunch tallied 13 hits. Zach Green, Dave St. John, Austin Sanders, and Cory Veres all managed multiple hits for Orlando Brunch. Green went 3-for-5 at the plate to lead Orlando Brunch in hits. Rangers saw the ball well today, racking up 11 hits in the game. ErnestoSosa, Kline, Trevor Nelson, and Valentin Gonzalez Sr all had multiple hits for Rangers. Sosa led Rangers with three hits in four at bats. The Brunch will face the Rock On, with the inner to face the Cubs, who knocked off the Expos 15-2 for the 25+ championship. For the veterans, a couple of old rivals will face off for the championship this spring. The A`s pulled off a double steal to tie the game with the Yankees late, then executed a suicide squeeze to win it, to ice the comeback victory over the upstart Yankees, led by manager Eric Echevarria. After falling behind 3-0 and 4-1 early, the A`s battled back to win against a much-improved Yankees squad 6-4 at Seminole. Evan Loicono (3-3 with a run scored) and Russ Miller (2-3) paced the offense. Starter Joe Hamilla and reliever Tony Burnham combined with a solid defensive effort held the Yanks to one run over the final eight frames to capture the win. The Phillies traveled to Lakeland to face the resurgent Polk Sox, and came home victorious and set for the final game. Warren Hanson went the distance giving up just 2 unearned runs and striking out 7. Scott Budds led the Phillie comeback with a bases clearing double with 3 on. The Sox side of the story went like this: Sox score 1 unearned run in the 1st and 2nd innings to take the lead early. Eric Haynes was in command early not allowing a runner past 2nd thru the first 5 innings, but in the 6th the Phillies score 3 unearned runs to take the lead. The Phillies score 3 more in the 8th (1 earned) and 1 more unearned in the 9th to cap a 7 to 2 victory. Warren Hanson settled down after the 2nd inning, going the distance for the win, picking up 7 K`s along the way. For the Sox Haynes went 7 innings giving up 1 earned run with 4 K`s taking the tough luck loss. At the plate for the Sox Haynes led the way with 3 hits, Lorne Wheatcraft and Paul Segarra had 2 each and Randy Phillips, Ric Moots and Pete Gonzalez each had 1 hit. For the Phillies Hanson helped his cause at the plate with 2 hits and Budds had the big hit of the day, a double in the 6th to give the Phillies the lead that they would not relinquish. The 25+ division has the #5 Brunch facing the #2 Rangers in an elimination game at 9 AM on Sunday the 17th at Clermont, to be immediately followed by a 12:30 single elimination game between the #4 Expos and the #3 Cubs. The lowest remaining seed will face the the RockOn next Sunday the 24th at 9 AM at South Orange, with the winner of that game facing the highest remaining seed at 12:30 for the championship. In the 38+ division, the A`s host the Yankees at Seminole High School at 10 AM this Sunday while the Phillies travel to Tenoroc High School in Lakeland to face off with the Polk Sox in the other semi-final, also at 10 AM. The winner of those games will face off on June 24th for the championship at a site to be determined. Good luck to all the teams involved and if you`re not in the mix this season, come on out and enjoy some playoff baseball. The fall season will start before you know it! Twins WIN!Matt Alacci was the pi�ce de r�sistance in Sunday`s game between the Bears and Twins at South Orange Little League. Alacci overcame arm issues that had plagued him all spring to throw a complete game, giving up zero earned runs and striking out 10+ as the Twins beat the Bears 8-2 to earn their first non-forfeited win of the season. Alacci did not allow a run to score after the first inning and consistently stranded runners in scoring position by using off-speed pitches to strike out Bears. Alacci also did his best Babe Ruth impression at the plate, going 3-4 with 2 RBI and a run scored. Erik Burch (2- 2, 2 BB, 2 SB, 3R, RBI) was Mr. Do-It-All on offense, while Matt Johnson and Caleb Bush both added 3-4 days at the plate. Other Twins contributing to the cause included Kyle Thomas (2-3, SB, 2RBI), Ron Albright (2-3, SB, R), Paul Kilgas (1-3, 2 SB, R) and Chris Shogren (1-3, SB, RBI). In all, the Twins stole 9 bases despite looking like they each had a piano strapped to their back while running the bases. May 30, 2018 - One Game Highlights! How about some Twins highlights! Scoring 7 runs in two different innings, the Athletics topped the Sox at S. Orange. The offense was highlighted by the team`s first-ever grand slam. Tom O`Brien, (3-3, HR, 5RBI, SAC, 2R, SAC) who drilled a long single off the bottom of the left-center wall in his previous at-bat, smashed a no-doubter to clear them all in the 3rd. Several other A`s pitched in to spin the scoreboard: Jose Alvarez (3-4, 2B, 2R, RBI), Jason Ziegler (3-4, 2R, RBI), Joe Hamilla (2-3, R, 2RBI, BB), Evan Loiacono (2-3, 2R, 2RBI, ROE), and Lou Prano (2-3, 3R, 2RBI, BB). Hamilla (7-1) was the winning hurler, picking up an efficient W scattering seven hits over five in the shortened affair, walking one and striking out six. Joe Hamilla tossed a five-hitter and the A`s pounded out 14 hits as the Athletics dropped a shorthanded Blazers team at Seminole. Hamilla (6-1) picked up a dominant win walking only one while fanning eight. Dean Hill stroked 4 singles (4-5, 3R, SB, ROE), Dustin Owen lined three of his own (3-4, 3R, 2RBI, SB, ROE) and Tony Burnham singled and doubled (2-5, 2B, 3R, ROE, SB) to pace A`s O. The Expos beat the previously undefeated RockOn by a score of 8-5. Graham Frederick threw a 9 inning complete game, allowing 2 earned runs (5 total) against a strong RockOn squad. Brandon Wilds, Joe Machovina and Armando Berrios each drove in two runs and Peter Amico scored two runs. Miguel Maldonado got the big rally started with a single to start a 6 run 6th inning. The Sox sweep the Tigers 9 to 8, and 14 to 5. The Sox come from behind in the first game with 4 runs in the last inning for a walk off win with David Collins driving in the winning run. The Sox then score 6 in the first inning of the second game going on to win 14 to 5. Eric Haynes goes all 7 innings for the win and added 3 hits on the day. For the Sox Ric Moots, Lorne Wheatcraft, David Collins, Pete Gonzalez and Felix Gonzalez all had 4 hits, John Cloutier had 3 hits and Andre Andrews had 2 hits in the second game. Cubs put up 2 in the first only to give up a 5 spot to the Expos. The Cubs bats were alive though, putting up 18 hits and 14 runs over the next 5 innings and it was too much for the Expos to come back from. Vasquez hit his first HR of the season to dead center. Est 395ft shot. J Page had a double going 2-3. Louderback was 3-3. Little, Santiago, Skyles all went 2-4. Sox win a tight game against the Reds 6 to 5. The Sox break a 4 all tie with 2 runs in the bottom of the 8th and hold off the Reds in the 9th, after the Reds score a run and threatened for more. Pete Gonzalez started on the mound and went 3 innings, striking out 1 before handing it over to Eric Haynes, who went 6 innings with 5 Ks. Haynes also had a double in the 8th to break the tie. Daryl Fenley picked up the other RBI in the 8th with his 3rd hit of the day. Lorne Wheatcraft and Ric Moots had 2 hits and DJ Rogers reached base 3 times for the Sox. Jeramy Louderback back shut down the Mets with a 1 hit performance. Big day at the plate for the Cubs. Dingman was a HR shy of the cycle going 3-3 with 4 RBI. Louderback was 2-4 with 2 doubles. T and J Page also had doubles with 2 RBI. Rennolds also joined the double club. Cubs come back in the top of the 9th after being down by 3 and put up 5 runs in the inning. Louderback got the W in the complete game striking out 8. Notable hitters Vasquez 5-5 with a double and the only extra base hit of the game. Skyles 4-5, Santiago 3-5, Louderback and Little 2-4. Orlando Brunch had everything working on Sunday, winning big over A`s 11-1. A`s opened up scoring in the first inning, when Tom Obrien singled on a 3-2 count, scoring one run. Orlando Brunch notched five runs in the fifth inning. Orlando Brunch big bats were led by Kevin Boyce, Cameron Dotson, and Derek Miloff, all driving in runs in the inning. Shaun Delozier was credited with the victory for Orlando Brunch. He allowed five hits and one run over eight innings, striking out four and walking one. Orlando Brunch scattered 13 hits in the game. Zach Green, Delozier, Matt Sleik, and Boyce all managed multiple hits for Orlando Brunch. Boyce, Sleik, Delozier, and Green each collected two hits to lead Orlando Brunch.Dean Hill went 2-for-3 at the plate to lead A`s in hits. Sox split with the Blazers. Sox win the first one 9 to 1, Lorne Wheatcraft goes all 7 innings with 7 K`s also picking up 2 hits at the plate. Ric Moots, Pete Gonzalez and Daryl Fenley all had 2 hits and Paul O Segarra had 3 hits. Sox drop the second game 4 to 7, Eric Haynes went all 7 innings giving up only 2 earned runs. .
Nats swept a doubleheader 8-7 and 11-1. Mickey Biancaniello had a day at the plate and brought in the winning runs in Game 1. Kutler Lane shut them down in Game 2 on the mound. Cheers to Sunday! Expos win 3-2 against the Nationals. Graham Frederick and Drew Mikler combine to hold Nats to just 2 runs. Offensive players of the game, Alphonso (Zo) Lewis and Joe Machovina. Zo went 2-4, 2 SB, including the game winning RBI. Joe went 1-2, R, BB, RBI. Three consecutive RBI singles by Jason Ziegler, Adam Bransfield, and Mark Maznicki erased a 6- 5 deficit late, as the A`s came back to beat a resilient Reds squad at Edgewater. Up 5-1 after four, the Athletics found their winning streak in jeopardy after a Reds four-spot in the 5th but again answered the bell. Dean Hill was the offensive star of the day lacing four line drives (2-4, 2B, 1B, 2 RBI, R, SB) while Ziegler, Dustin Owen, and Tony Burnham added 2 singles apiece. Joe Hamilla (4-0) was the winning hurler going seven strong, allowing five ER, fanning six and walking only one. Burnham came on to pitch a hitless eighth for his first save of the year. Joe Hamilla went the distance as the A`s downed the Nationals at Seminole 8-4. Hamilla allowed two earned on seven hits, struck out four and gave up one only one walk. Dustin Owen`s 2RBI knock up the middle capped a five- run third answering the Nats four-spot in the top of the frame. Tony Burnham stayed hot with a double in the 5th. Seven runs in the third inning led Orlando Rangers past Bears 12-1 on Sunday. Orlando Rangers batters contributing to the big inning included Will Schingl, Trevor Nelson, Rikki Kline, Valentin Gonzalez Sr., Valentin Gonzalez, and Mike Kweder, who all drove in runs. Orlando Rangers got things moving in the first inning, when Kline singled on the first pitch of the at bat, scoring two runs. Orlando Rangers put up seven runs in the third inning. Schingl, Nelson, Kline, Gonzalez Sr., Gonzalez, and Kweder all drove in runs in the frame. Schingl pitched Orlando Rangers to victory. He surrendered one run on three hits over five innings, striking out six and walking zero. Scott Mikrut threw two innings in relief out of the bullpen. Orlando Rangers totaled 14 hits in the game. Brian Rebando, Nelson, Eric Roukey, Kline, and Jeff Fortune each had multiple hits for Orlando Rangers. Fortune, Kline, Roukey, Nelson, and Rebando all had two hits to lead Orlando Rangers. Sox trail 9 to 0 after 4 innings and come back to win 15 to 10 taking the lead for good with 7 runs in the 9th inning.Bobby Ruis went 7 innings giving up 2 earned runs and Randy Phillips goes 2 innings with 2 K`s to pick up the win. Ric Moots and Paul O Segarra had 2 hits, Lorne Wheatcraft had 2 hits with a triple and Andre Andrews had 3 hits with a double and 3 RBI`s. Game 1 Brunch 8 Mets 0 Shaun Delozier shut down Mets, throwing a complete game shutout and leading Orlando Brunch to a 8-0 victory on Sunday. Orlando Brunch pulled off the big victory without ever scoring many runs in an inning. The most they scored was two in the fifth. Orlando Brunch got things moving in the second inning, when Dylan Kipp singled on the first pitch of the at bat, scoring one run. A single by Kg in the second inning was a positive for Mets. Delozier earned the victory on the pitcher`s mound for Orlando Brunch. He surrendered zero runs on three hits over seven innings, striking out six. Paul took the loss for Mets. He allowed 12 hits and eight runs over six innings, striking out six. Orlando Brunch totaled 13 hits. Cory Veres, Delozier, Kipp, and Scott Alfano each had multiple hits for Orlando Brunch. Veres went 3-for-4 at the plate to lead Orlando Brunch in hits. Orlando Brunch was sure-handed in the field and didn`t commit a single error. Evan Pfleuger had the most chances in the field with six. Kg led Mets with two hits in three at bats. Game 2 Mets 9 Brunch 14 Orlando Brunch and Mets matched up in an exciting back-and-forth game that saw Orlando Brunch coming away with a 14-9 victory. The game was tied at eight with Orlando Brunch batting in the bottom of the fifth when Dylan Kipp homered on a 2-0 count, scoring three runs. There was plenty of action on the basepaths as Orlando Brunch collected 12 hits and Mets had ten. Mets captured the lead in the second inning. Kg doubled on the first pitch of the at bat, scoring two runs. Orlando Brunch scored four runs in the fourth inning. The offensive onslaught by Orlando Brunch was led by Brady LaBarge, Mike Price, Derek Miloff, and Evan Pfleuger, all driving in runs in the inning. Mets scored three runs in the fourth inning. Mets scored its runs on a home run by Matt. Miloff earned the win for Orlando Brunch. He lasted one inning, allowing two hits and two runs. Andy Hucke threw two innings in relief out of the bullpen. Hucke recorded the last six outs to earn the save for Orlando Brunch. Steve took the loss for Mets. He lasted three innings, allowing six hits and eight runs while striking out one. Scott Alfano started the game for Orlando Brunch. He lasted four innings, allowing seven hits and six runs while striking out one. Orlando Brunch tallied 12 hits on the day. Cory Veres and Pfleuger all collected multiple hits for Orlando Brunch. Veres went 3-for-4 at the plate to lead Orlando Brunch in hits. Mets tallied ten hits. Bob and Kg each racked up multiple hits for Mets. Bob led Mets with three hits in four at bats. Dave Bagwell came within an out of going the distance as the Reds held on to beat the Yankees. Adam Greschler had 3 hits, and Edgar Navas and Guy Robinson had two each for the Reds. Vern Ramassar had three hits for the Bombers, while Alex Santiago, Billy DeVuyst, Ty Inomata and Al Baum each had two. Cubs win 15-5. Santiago was the big hitter of the day going 3-3 with 3 singles. Stone had 2 Double going 2-4. Rennolds and Little also had doubles. Skyles goes 5 2/3 Striking out 6. Redlin closed it out going 1 1/3. All 5 Mets runs were unearned. Expos win despite any early triple play turned by the Brunch. Player of the game, Armando Berrios with an inside the park HR. Sox win 13 to 2. Pete Gonzalez picks up the win going 5 Innings with 5 K`s and 0 earned runs, Randy Phillips goes the last 3 innings giving up no runs and adding 3 K`s. DJ Rogers, Ric Moots and Pete Gonzalez all had 2 hits, and Lorne Wheatcraft had 3 hits with a double. Russ Miller allowed only one run and Lou Prano scorched the team`s first triple of the season as the A`s downed the Tigers. Miller (1-0) scattered three hits over six for the W, striking out four, and Tony Burnham pitched a scoreless seventh. In his first game of the season, Tony Burnham went 2-3 with 2 SB and 2 runs scored. Tom O`Brien stayed hot 1-1, 2 BB, SB, R, RBI, and newcomer Evan Loiacono drilled a 2 RBI single in the five-run seventh. It took extra innings, but the A`s singled in the winning run for the second time in as many weeks at Seminole. Jason Ziegler laced a single to right-center to score Dustin Owen and end it, and Lou Prano turned a triple-play at second in the 4th to help the Athletics singe the Blazers 11-10. Owen (2-5, 2B, 1B, 3RBI, 3R, SB) and Tom O`Brien (2-3, 2B, 1B, 2BB, 2RBI, 2R) paced the A`s offense. Joe Hamilla singled 3X going 3-4 with a Sac Fly + RBI and picked up the win in relief, and Adam Bransfield chipped in with a 1B, 2BB and 3R. Russ Miller started and fired 7 innings, giving up 2 ER and picked up 5 K`s in a no-decision. Sox win 17 to 2. Eric Haynes throws 6 innings with 4 K`s and has 2 hits and 4 RBI`s at the plate. Randy Phillips, Lorne Wheatcraft and Ric Moots all had 2 hits, Daryl Fenley added 3 hits and Paul-O Segarra had 5 RBI`s. Expos win.15-11. Player of the game, Drew Mikler, 4-4, 3 RBi, 3 R, 3 IP, 1ER. Adam Bransfield singled home Tom O`Brien in a 3-Run A`s ninth for a dramatic comeback win in the season opener at Seminole. A game Yankees team led the entire game but could not hold off the late-inning heroics, and A`s rookie Jason Ziegler blasted a solo shot to left in his first Athletics at bat. O`Brien finished the day perfect at the plate with a single, 2 BB, 2 HPB, 2 RBI and 3 runs scored. Mark Mazinicki went 3-4 and captured a walk in 5 plate appearances and Bransfield finished 1-2 with 2 BB and 3 RBIs. Joe Hamilla (1-0) overcomes five errors to keep the A`s in it until the late-inning rally, only surrendering 3 ER while striking out six. Cubs win 11-4 Skyles goes 9 inning on the hill striking out 10. Santiago goes 3-3, Page, T goes 3-5 and Rennolds, Page, J and Skyles go 2-4. Everyone had at least one hit. Sox fall to Phillies 15 to 8. After falling behind early, Eric Haynes leads comeback attempt with 3 hits at the plate and 3 K`s in 3 innings of relief on the mound. Pete Gonzalez went 7 innings with 7 K`s as the PolkSox opened the season with a victory on the road. Mike Grenci and Jeff Shebovsky combined for a 1 Earned run pitching performance as the Reds won their opener? Don`t see you team here? Have you manager send in a highlight! February 06, 2018 - Missed the draft and still want to play? We have several teams looking for players of all ages and skill levels!Send me a note to blevinsknows@hotmail.com with your age and what positions you play and contact info, and we`ll get you playing just as soon as you`re ready! Did I leave you alone long enough? Hopefully we are ready to leave this cold snap behind and get ready to play some baseball this spring. The registration and draft for new players and those not being asked to return to their former teams will be Sunday, January 28 at 10 AM at Edgewater High School in Orlando. 16 game schedule, plus playoffs, done 3rd week of June, no holiday weekends, start Feb. 11, (or 2/4, if your team is ready and willing...)$185 per player, 14 man minimum, payable to Central FL Men`s Senior Baseball, PO Box 4025, Apopka, FL 32704, or you can use a credit card on the PayPal button on the left of this page. No pay, no play, is our rule, and we stick to it. Looking forward to getting back out there! Please confirm your plan to attend the draft and/or participation for this spring by dropping me a note to blevinsknows@hotmail.com Wishing you all the best in 2018! December 11, 2017 - Phillies and Rock On Win Championships! Congratulations to our champions, one old, the Phillies having won 5 of the past 6 championships in their division, and one new, the Rock On coming out on top in their debut season. Game reports to follow. The finalists in the two divisions were emphatically set Sunday. Tony Caruso spun a shutout for the Blazers to join the Phillies in the finals, led there by a Scott Budds shutout. These two venerable teams will meet at 9 AM this Sunday the 10th at South Orange. The Rock On also won by shut out, and will meet the top- seeded Nationals, who allowed a single run Sunday in their run rule victory. These league newcomers will square off at 12:30 at South Orange for a first championship for one team or the other. Come on out and enjoy this exciting conclusion to a great 2017 fall season! O`Jays come away with a win against the Yankees 12- 2. Kevin Romero went 5 innings strong, Matt Freeman with 3 in relief, trying out pitching for the first time, and closing the game, Gustavo "Mr. Clean" Galo added 2Ks to his pitching stats. The bats came alive, Christopher Delvalle with two doubles and 3 runs and 3 RBis for player of the game. Expos beat the Sox on a wet Sunday. Graham Frederick pitched all 5 innings and allowed just 1 run. Josh Schwarz offensive player of the game. 2-3 with 2 2B, 4 R, BB, and turned a K into another `double`. Cubs win! Mike Skyles threw 7 innings struck out 6 in the win. Little and Stone went 3-4. Stone picked up 4 RBI`s as well. Louderback, Page ,T and Skyles went 2-4. Even though the Orlando Avengers collected 12 hits to Rock On`s nine, they still fell 4-2 on Sunday. The Orlando Avengers got things started in the second inning, scoring one run when 2nd baseman Mike Porter singled after a freshly hit two-bagger by Kaymoi Graham. Anthony Lupa pitched a well executed complete game in the tough-luck loss, striking out 7 and helping his own cause with an RBI single. Avengers Jorge Michelena, Mike Porter, Zack Moyer & Zack Wright each collected 2 hits in the spacious confines of Bishop Field. Zax Little pitched a strong 7 innings only giving up 1 earned run in the Cubs win. Tristan Page closed out the 8th and 9th. Page, T, Vasquez, Rennolds, Dingman all went 2-3, Vasquez getting his first triple and Rennolds his first Double of the season. OJays won 8-3 against Rangers. Zach Roermeman with the Win, pitched 6 innings. Peter Ortiz with theSave, pitched 3 innings to close it out. Jim Pinero went 3-4 with 2 RBI and 3 runs for player of the game. The Avengers won 6-2 vs a very knowledgeable Twins squad behind a complete game by starting pitcher Jorge Michelena, who also had 12ks to help his own cause. Home Runs by The Hulk Zack Moyer and War Machine John Maldonado sealed the deal. The Avengers offense pounded out 14 hits total, 2 each by Marrero, Wright, Moyer, Michelena and "Thor" Recker. Cubs Win big 22-7. Jason Page hit his first HR going 4-5 with 4 RBI. Just a triple shy of the cycle. Chris Stone, Javier Santiago, Zak Little also went 4-5. The Rangers came out swinging to take an early lead, scoring 1 in the top of the 1st inning. The Avengers tied it up in their half and took a permanent lead 5-1 in the 3rd inning, behind a strong 8 inning outing by starting pitcher Anthony Lupa. Zack Moyer led the offense with a 1B, 2B & 3 RBI day at the plate. Offensively, Zack was complimented by multiple hit games from Anderson Villarroel from the leadoff spot, Vic Marrero and birthday boy War Machine John Maldonado. Expos win a against a tough shorthanded Twins team 23-11. Player of the game, Brandon Wilds, went 4-4, BB, 2 HR, 7 RBI. Cubs win 10-9! The Rangers put up 8 runs in the first two innings,but the Cubs battled back in the second half of the game to take the lead in the 7th. Tristan Page went 6 innings and Mike Skyles closed out the last two. Leo Vasquez was 3-4 with a Double and 2 RBI. Skyles was 2-3 with 2 RBI. The Blazers surprised the Expos in overwhelming fashion. Scott Donlelick went 4 for 4, Dave Gushleff and Matt Conrad each had 3 hits, Rick Sanders and Joey Neira combined for a one-hitter. The Bears won 7-2 behind a complete game from Amaury Luna. John McGreevey went 3 for 4 with 3 RBI, and Eric Rios went 2-4 with 3 RBI. Cubs take the lead late. In a 2-1 game until the seventh inning. the Cubs bats finally come to life to put up 4 runs. Tristan Page 2-4 with a Double, Jeremy Louderback 2-3, J Page also 2-3, ZakLittle 1-3 Double. Mike Skyles went the distance going 9 for the complete game. Michael Arsenault shut down the Reds on 4 hits and the Nationals cruised to a 12-1 victory Sunday. Expos beat the Brunch 8-4 in a quick 9 inning affair. Graham Frederick gets the win and Brandon Wilds gets the save. Big shoutout to Josh Schwarz for a clean 7th inning setup appearance on the hill and his run saving defense at 1st. Erick Heberling and Dave Bagwell combined to hold the Blazers to 3 hits as the Reds defeated the Blazers for the first time in a long time, 6-2. Hall of Famer Felix Soto Toro had three hits, drove in one and stole a couple of bags, and Craig Feeney and Jeff Shebovsky each had a couple of hits to pace the offense. The Tigers won their first game in franchise history, 7-3 over the Polk Sox. Congrats to manager Rey Lopez and the team! Scott Budds of the Phillies struck out 18 Rock On hitters, as the Phils upset the younger division leaders 5-2 in 11 innings. The Bears won again, 2-0 as Dave Moore and Amaury Luna combined to shutout the Avengers. Both teams were strong on the mound on Sunday, but the 1st place Bears were just a little bit stronger at the plate in victory . Anthony Lupa started the game for the Avengers, going the distance for a complete game lowering his ERA to 1.57 with 8 K`s, 2 walks and 2 earned runs. The Twins beat the Cubs 10-4 as Stephen Bordenkirtcher went the distance with 5 K strikeouts. Clint Clymer went 3 for 3 with a double and 2 homeruns and 5 RBI. Fly the curly W! The Nationals beat the Rangers 2-1 in a hard fought game. Mike Arsenault goes 9 and strikes out 10 batters. Andy Ladisa had both RBI`s and Brian Shomock went 3 for 3. Nationals Win! A curly W! Michael Arsenault threw a complete game, with 14K`s, allowing a lone run. Christian Leonard and Steve Demeree combined for 5 hits. Jorge Michelena was in the zone on Sunday, tallying five hits, five RBI, leading Orlando Avengers to an 11-5 win over the Brunch. Avengers Ace Anthony Lupa pitched a strong 7 innings, giving up 1 earned run with 8 K`s to get the W. Mark Vassallo and Lupa notched 3 hits apiece with Geo Plaza and Zack Wright racking up a couple each. Stellar defense by Anderson Villarroel and War Machine John Maldonado set the defensive tone. September 29, 2017 - Eagles Nest games at Eagles Nest! We are set to resume the original schedule this week, repairs are complete. So Eagles Nest games are now at Eagles Nest, directions from your location are on the link to the right. Cubs win 3-1 Tim Burtsztynski pitched 4 innings of no hit ball. Zax Little and Tristan Page closed the game out holding the Expos to 1 run. Tristan Page was the big hitter of the day going 3-3. Blazers tie Phillies 2-2 in 10 innings with both teams playing defense when needed. Great pitching from both Warren Hanson going 9 inn and Scott Budds in relief for the Phillies and our Tony Caruso going the distance for the Blazers. Great fun playing these guys! Orlando Avengers Wins Back-and-Forth Affair Against Sox After the Sox led early, tied at 3 going into the 6th inning Starting Pitcher Zack Moyer doubled in the tie-breaking run sparking a rally of 5 runs in the bottom frame. The bats came alive with the Avengers smashing 14 hits. Geo Plaza led the offense with a 3-4, 3 RBI performance. Geoff Recker also collected 3 hits to set the table. Newly acquired War Machine John Maldonado was 2-2, 2 runs, BB and an RBI. A solid 5 inning pitching performance by Jorge MIchelena earned him and The Avengers their first win of the season. 0 errors committed underscored the 10- 4 victory. August 17, 2017 - Still Want to Play? I have still have a couple of teams looking for ballplayers! Send a note to blevinsknows@hotmail.com and we`ll get you on a team and playing ball ASAP! August 02, 2017 - Fall Baseball!! Each Friday a list is sent out to the managers on who is eligible that Sunday.(paid). No player may participate who is not. That takes the onus off the manager, it works out well, and protects the rights and playing time of the player who is protected against ringers and outsiders who might take their At Bats, etc. Additionally, we tolerate zero malcontents, guys who like to argue with umps, fight, etc. We all have to go to work on Monday. This is our 50th season! We are the longest serving amateur baseball league for men in the state! (Not even sure that`s true, but it sounds cool..) There are cheaper options, but we keep smaller rosters so that there is more playing time. We have open substitutions on defense and elongated batting orders so that everyone feels a part of the game. You paid, you should play! If that sounds good to you, we would love to have you in the league! Also note that uniforms and medical insurance are NOT included. Some teams have small charges for the uniform, or a team set, and medical insurance for team adult sports is prohibitively expensive, so you have to be on your own there. June 27, 2017 - Mets, Twins and Phillies are the Champions! 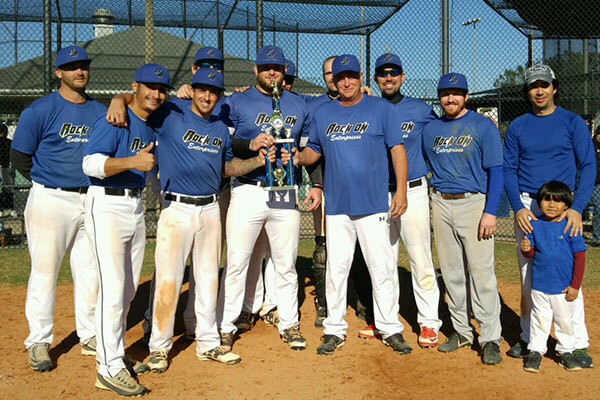 The Mets won the best of 3 series vs the defending champion Ojays to capture the 18+ crown. The Twins upset the defending champion Rangers to claim their first championship in the 25+ division. Kevin Kellerberg and Joel Burgos were co- mvps. Kevin notched 7 innings of shut down pitching allowing 1 run, with 8 Ks. Joel Burgos came up 3-4 with 3 RBI and 2 runs scored. Jay Zerquera rescued us in the 6th inning after our starting Catcher had some dehydration dizziness. 39 year old Jay Z strapped on the the gear to catch the final innings in the sweltering heat. Team Captain Wendell Perez and Mgr Ricky Klotter were proud of the guys on this playoff run. Finally, the Phillies dynasty continued their dominant reign in the 38+ division with a 2-1 victory over the Blazers. 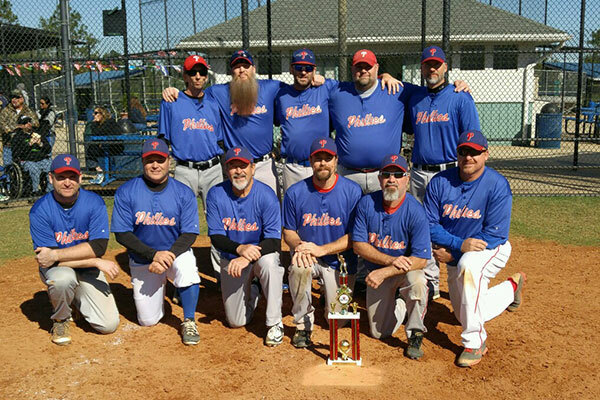 The Phillies won the Spring 2017 Championship behind the right arm of Scott Budds who fanned 14 Blazers in a tight 2-1 win. Budds pitched the complete game and finished the year 9-0 with a 1.25 ERA and 101 strikeouts. Matt Butler had a huge RBI single in the 2nd and finished the day 2-3. Barrett Gugliotta also added a pair of hits finishing 2-4. Budds had the game winning RBI walk in the 4th to give the Phillies the lead for good. He topped it all off striking out the side in the 9th to finish it. Awesome year Phillies! Big props to both our Pitchers and defense. When you finish the year with a team ERA of 2.05 you will be in position to win a lot of games. Details and team pics to follow. June 19, 2017 - Finals Set! Blazers Win! Tony Caruso pitched a solid 6 innings to hold the Yankee offense in check in a 16-1 victory. The Blazer bats started slowly but scored their first run in the bottom of the third on a Carlos Ruperto single that scored Jay Claudio. The Blazers then put up 4 in the 4th; 8 in the 5th; and closed it out with 3 in the 6th behind a triple by Bill "Moose" Musacchio and a long double by Ishy Cruz. Jeff Bouley banged out 2 long doubles in an awesome display of "Warning Track Power", as reported by the Blazer correspondant. The Blazers will face the Phillies at 9 AM next Sunday at Edgewater High School for the 38+ championship. Rangers to defend their championship against the TwinsOrlando Rangers defeated Cubs 9-0 on Sunday as three pitchers combined to throw a shutout. Joshua Frank struck out Javier Santiago to finish off the game. Orlando Rangers grabbed an early lead on a double by Julio Lara, and a groundout by Eric Roukey in the first inning, then a single by Joshua Frank in the second inning. A bright spot for the Cubs was a single by Tristan Page in the second inning. Ernesto Sosa earned the win, pitching seven innings, allowing zero runs, three hits, striking out three, and walking one. Two relievers helped Orlando Rangers close out the victory. Scott Mikrut threw one inning. The Rangers had 11 hits in the game. Will Schingl and Frank each collected multiple hits to lead Orlando Rangers back to a title defense yet again for what has to be now described as a dynasty team in Central Florida amateur baseball. The upstart Twins will attempt to deny the coronation at 12:30 Sunday June 25th at Edgewater High School after upsetting the Angels. Wendell Perez, who must have been very well-coached in high school, had 2 hits and 1 RBI and 2 Runs Scored and got a bases loaded save in the 9th. Joel Burgos had a base clearing double with 2 RBI. And despite the 100 degree weather 39 year old Jay Zerquera caught all nine behind the plate and his blocking stopped the Angels run game. Twins 9-4 win over the Angels. Run rule in effect for all playoff games as always, but time limits also in play this year, so hustle them in and out. No new inning after 2 hours and 45 minutes. Lets beat the rain! Championships will be next Sunday, June 25 for all three divisions, times TBD. Good luck! Cubs Win!Tristan Page went a strong 5 innings giving up only one run. The game started off close until the 4th inning when the Cubs bats came to life where they put up 7 runs and knocked out their starter. The 5th inning was a repeat of the 4th putting up another 7 runs. Mike Arsenault came in the 6th for 2 shut out innings to shut the door on the Expos. Notables: Leonard 2-4 (Double, 2 RBI), Little (2-3 2 RBI), Smith (2-4 @ RBI). Yankees Win, Tha-a-a-a Yankees Win!Al Baum held the Reds to 4 hits, and shut them out until the 9th as the Yankees and manager Eric Echevarria advanced to the semi finals for the first time. Alex Santiago had a two run single in a five run 2nd inning, and the Yanks never looked back. Additionally, this Sunday the 11th, the Rangers will play the Rays at 10 AM at Bear Creek in a regular season game. Angels, Blazers, Royals off this Sunday. Still waiting on Royals and Rays to confirm Grey Cup on the 18th. The Blazers took 2 from the A`s at Seminole HS. First game was the Lilio Alvarez show as he pitched 6 strong innings and had a 3 run double in the 6-3 victory. Joe Del Valle came in to close the game. In the loss, Hall of Famer, Joe Greene smoked a 2B to deep right. Game 2 was a great Blazer team effort backing Marty Jones on the mound in 15-2 win. Hitting was highlighted by 2 baggers by Manny Ortiz and Joe Del Valle. The Rangers nee Pirates found themselves in a familiar perch after Sunday`s play, back on top! The Rangers nipped the Angels 4-3 on Will Schinagl`s 2-hitter in a battle for the division lead, then completed the sweep in the 2nd game by beating the Rays......It was Oak Ridge Pioneer Alumni Day in the Twins win, as manager Ricky Klotter had Taylor Maroney throw 8 innings with 8 K`s, and Wendell Perez drove in three runs...Manager Adam Bransfield had 4 hits, scored 4 runs, drove in a couple more, and caught 14 innings in the humidity to power the A`s sweep of the Reds.... Score one for the old guys as the Blazers topped the OJays 13-7. Chasing 2 in the bottom of the 5th the Blazers came alive and put up a 10 spot with a few timely hits and good patience at the plate. Dave Gushleff and Marty Jones each had 2 hits. Jay Claudio had 2 RBI`s and Joe Del Valle knocked in 3 runs with 2 hits. Marty Jones gutted it out on the mound for 7 innings giving up 7 runs (but only 1 earned run) to earn the complete game win.....The Mets and Royals waited all day to play, then got hit by a rogue rain cell right at game time. Everybody knows that`s nobody`s idea of a good time, thanks for being kind to the field guys....Tristan Page threw a complete game shutout. Leonard had a Triple, Skyles and Jason Page had Doubles. Little, Louderback, Rennolds and Santiago went 2-3 with two singles in the Cubs split of their twin bill. Expos beat the Mets after Brandon Wilds drove in Peter Amico in the bottom of the 10th to cap off the extra innings come back win. Chris Stahl saved the day for the Expos in the bottom of the 9th with an RBI double and later scored the tying run on a passed ball. Scott Budds and the Phillies continue their championship defending romp through the Nat Haber Division with a 17-3 shellacking of the Reds at Celebration High School. Budds topped off his dominating pitching with a 3-run blast to left center. Mike Grenci threw shut out baseball for 6 innings, with 10 K`s and Guy Robinson, Jason Bailey and Jeff Shebovsky each had two hits as the Reds won their first of the year. Austin Benz hit a long home run for the Rays....Five runs batted in from Marcus Smith helped lead the Orlando Rangers past the Cubs 13-2 on Sunday. Smith drove in runs on a double in the first, a triple in the third, and a single in the seventh. Orlando Rangers scored on a single by Julio Lara and a Smith double in the first inning. Orlando Rangers scored four runs in the third inning. A single by Ernesto Sosa, a fielder`s choice by Brian Rebando, and a triple by Marcus Smith. Ray Sanabria earned the win for Rangers. He pitched four innings, giving up two runs, five hits, striking out three, and walking zero. Dustin Williams threw two innings, as two relievers helped Orlando Rangers finish off the victory. Smith, Sosa, and Joshua Frank each collected multiple hits ..... Expos beat the Blazers! Danny Petit went 9 innings in a complete game win. Joe Machovina went 4-4, with a double, and scored 4 runs. Marilyn Brown got hot at the plate, going 2-2, with two singles, and a run scored. A tired Expos team beat the Yankees in an error filled, 5 inning, 16-12 win for the sweep......Brunch 16 Royals 3, Kevin Boyce 3-5 with 3 RBIs, Derek Miloff 3-4 with 2B and 3B 3 RBIs, Shaun Delozier 4-4 with 2B and 3B 3 RBIs, Scott Alfano 3-4 2 RBIs 5 IP 3 ER and 4 Ks......The Twins knocked the Angels from the ranks of the unbeaten 11-7. March 13, 2017 - Week 5 Highlights! Cubs Win!- Mike Arsenault threw a complete game shut out. Striking out 7 and only giving up 3 hits. Zak Little when 3-4, Bradlee Cox 2-3 with 2 RBI, Patrick Smith 2-3 and Tristan Page 2-4. Expos Victorious!Expos win against a scrappy Rays team, 10-6. Peter Amico got the win, while striking out 9 batters. Graham Frederick gets the save. Twins Triumph in tight pitcher`s duel. Jay Zerquera drives in the lone run in a 1-0 Twin win. Blazers Blast Reds Marty Jones celebrated a long-anticipated return to the diamond with a three run bomb, Matty Conrad, another local legend, returned to the field with a couple of hits and a beautifully caught game, and Scottie Donelick threw a great game for the Blazer victory. Expos Win!Expos beat the Twins 7-6. Danny Petit got the win and the save. Started the game and pitched the first 7 innings and came back in the bottom of the 9th to get the save. Danny was also the MVP at the plate hitting a clutch, 2 out, 2 RBI double. BRUNCH WIN!Scott Alfano threw 6 strong innings giving up 3 ER on 4 Hits and 3 Strikeouts he also had a strong day at the plate going 2-2. Jon Marrero lead the offense going 2-2 with a double and 3 RBIs. Kevin Boyce chip in with a solo shot and threw 1 inning giving up 0 runs. The Brunch collected 13 hits on the day to get their first win of the year. TWINS WIN!Kevin Kellerberg hit 2 homeruns including a grand slam, had 6 RBI, as the Twins came back to defeat the Rangers. Be sure and have your manager send in the team highlights each week and look for your name here! Good, bad or funny, it all works! Mike Arsenault threw a complete game in the 7-5 victory Cubs over the Twins, striking out 11. Christian Leonard lead the home side off with a triple and Javier Santiago hit a 3 run single in the first to put the Cubs on top and they never lost the lead after that. Other notables were Zak Little and Mike Skyles who both went 2-3 with 2 RBI`s. Scott Budds spun up a 5-hit shutout as the Phillies blanked the Reds 8-0 in the opener for both teams. Shawn Borschert hsd three hits and Corey Anderson returned to the league with a pair of doubles. We are ready to get going, hope you are ready to play some baseball! We will play 16 games this spring, from the 2nd week in February through the beginning of June. Playoffs are concluded before the end of June, except in the event of an extended bad weather season. All of our games are on Sundays at various fields around metropolitan Orlando. We have a number of teams looking for players, and we are usually able to accommodate all levels of skill. We keep our rosters small, which ensures a lot of playing time. We also offer extended batting lineups and open defensive substitutions, which allows us to include most everyone, without compromising the competitive nature of the games. The registration and draft will be spread out over two dates. Those interested and qualified to play age 18 and over will need to report to South Orange Youth Baseball Complex at 9 AM next Sunday the 15th. (Directions from your location available on the tab on the left.) For those interested in the age 25+ and 38+ divisions, the date will be the following Sunday, the 22nd. You will register, then stretch and warm up for a light workout at 10 AM. We should be able to get you worked out and on a team before noon, for those interested in being home in time for the football game. By "light workout", we mean a quick IF/OF, pitchers and catchers throwing a bit, and a few cuts on the field. There are cages if you want extra swings on your own. We are also aware that you may not have been playing for a while, so nobody is looking for 100%, just dial it back, take it easy, the primary purpose is to make sure we have relatively equal distribution of talent, positions, speed, etc. Nothing to pull a muscle about. League dues are $180 this spring. This covers fields, 2 umpires per game (high school certified or better), baseballs, liability insurance (not medical), playoffs, booking agent, website, awards, and more, not to mention the camaraderie of playing this great game with a bunch of guys with similar passion for baseball in the longest tenured league in Central Florida. You can pay by check or money order sent to Central Fla. Men`s Senior Baseball League (CFL MSBL), PO Box 4025, Apopka, FL 32704, or if you`re still strapped from the holidays, you can use a credit card with the PayPal button on the left. Please include an extra $7. 50 if you choose that option. We even have the option of spreading out payments over time without interest, through PayPal. (not the league! :) You don`t have to pay to work out, (it would be nice and really helpful! ), but you will greatly enhance your draft status if you do, as everybody is looking for paid players. The league rule is "no pay, no play", and rosters will close by the end of the month. SO, pre-register by letting me know to expect you for the draft. (blevinsknows@hotmail.com) We look forward to having you in the league, and please don`t hesitate to let me know if you have any questions.